A call to Jessie Tsifitsi at the Edmiston & Company office in Athens brings confirmation of a €2 million price reduction on her joint central listing with Oceanstyle, the 33.5m motor yacht Astir. This superyacht's sophisticated exterior design is the work of the Cantieri di Pisa team, who are also responsible for the exterior styling and the entire engineering package on this eye catching Akhir 108. The Akhir semi-custom range began in the 1970s and each series features the same original design philosophy: high-performance planing hulls with unmistakable design. All recent builds feature hulls, superstructures and fibreglass components built by Gruppo Baglietto in Tunisia. 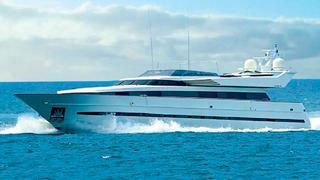 Built in 1998, she was last refitted in 2008 and is now asking €4 million.